Please NOTE: If ordering supplies for multiple devices please place one order per Site ID. If you do not have a service agreement with us, please make sure to include your device make and model, as well as your address. 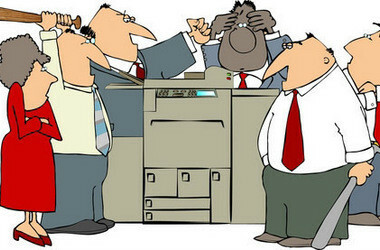 Prices for toner and other supplies vary by device. We will email you an invoice when the order is placed. Service call rate is $100.00/hour (plus applicable travel costs if ferry ride is necessary). Minimum 30 minute charge. All supplies (excluding staples), parts and labour are included if you have a service agreement with Westview Office Tech. Over the last 6 decades the copier industry has spent a gazillion dollars to prove scientifically that the chart above is 100% accurate. 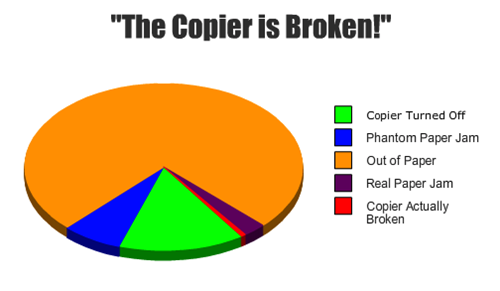 However, if you are having trouble with your copier, please don’t try to fix it yourself. We’re here to help!